Some chapati lying in your refrigerator idle for days? No need to waste it. 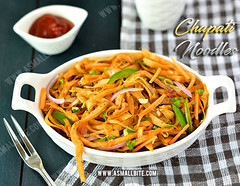 The leftover chapathi take a new avatar, join hands with chinese cuisine and transforms into chapati noodles recipe. I combined both hakka noodles and fried rice recipe already shared in my blog and prepared this leftover chapathi recipes. You can send this chapati noodles in your kids lunch box and they surely eat it happily without any complaints. As hubby is on a trip to US, taking care of my kids, sending them to school itself is a big job, so I am posting very simple recipes that can be done in minutes. For variation have a glance at tips section and if interested in knowing how to make soft chapathi? click this link…..